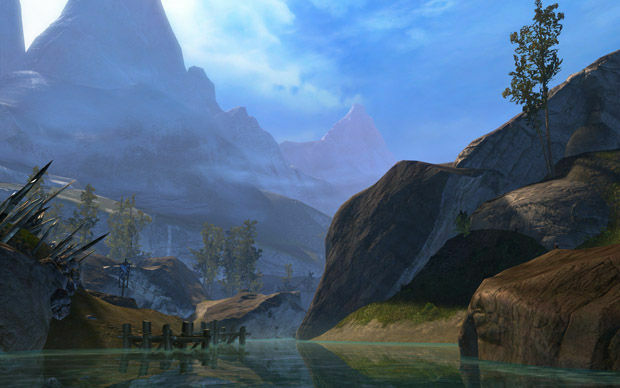 This weekend, ArenaNet gave select members of the press a chance to see the current beta of Guild Wars 2. We had the opportunity to create Human, Charr, and Norn characters of any class, and play through each race's level 1-30 zones. Additionally, we had access to the Ascalon Catacombs, a level-30 dungeon, as well as the opportunity to play on all of the Player vs. Player battlegrounds and try out the World vs. World vs. World PvP. I could use this preview to go into detail on the various systems (how combat works, what the classes are like, character creation, etc. ), but you can find accurate information on most of those topics on ArenaNet's website. What I found most fascinating about my time with Guild Wars 2 is how different it feels from any other MMO I've played before, while still keeping most of the elements of the genre intact. After creating my first character of seven, a Charr Warrior, I began in the Charr tutorial area. My first glance at the screen suggested there wasn't much new going on. I saw an NPC with a glowing green star above its head standing in front of me, some combat skills down in my hotbar, and quest details in the upper right corner. After completing the area and slaughtering a giant possessed statue with the help of about ten other players, I started to see what made the game unique. I tend to be a loner in MMOs; in World of Warcraft, I usually just quest by myself. I made it to level 85 with a Paladin, and I think I did maybe two instances. In Star Wars: The Old Republic, I did one Flashpoint and then spent the rest of the game completely by myself. 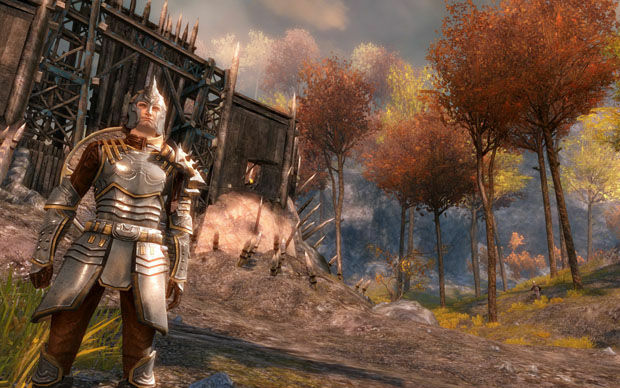 In Guild Wars 2, I found myself working consistently with other players, and for the first time, I didn't mind. While, as I mentioned earlier, there are still quest givers and floating green stars, that mechanic is only used for your Story Quests -- a quest chain that is personal to your character, instanced, and based on your race and the decisions you made at character creation. Every other quest and event, which will likely make up the bulk of your Player vs. Environment experience, are world events that just naturally happen. You'll hear that a farmer needs help tending his field, or will be informed that a group of harpies is launching a raid on a nearby rock quarry. And as you start running towards these battles, you'll see that most of the other players in the area are, too. When you start fighting or assisting, all you have to do is jump in and start working on quest objectives. You don't need to group up or join a party, you don't need to worry about mob tagging or kill stealing, and you won't miss out on experience or loot as long as you participate in some way. Because it's so easy to work together, and because there aren't any negative consequences, Guild Wars 2 is the first MMO I've played where I actually feel connected to the rest of the player base. Rather than hide from other players, or compete with them for quest spawns, I found myself actively looking for opportunities to help others. Instead of running the other way when I saw large groups of people, I'd start following them, since I assumed they were heading somewhere interesting. 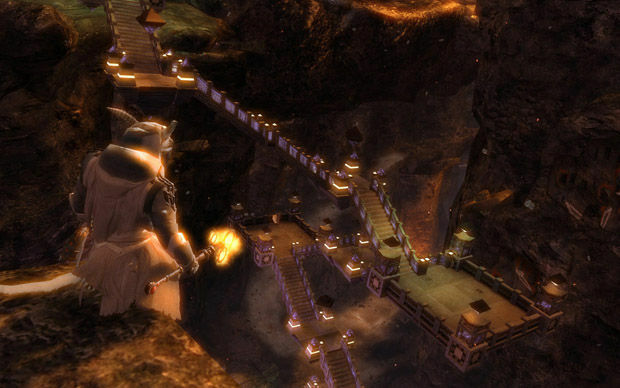 Social aspects aside, it didn't really strike me how fundamentally different Guild Wars 2's philosophy was until I ran the Ascalon Catacombs dungeon. The trinity as you know it is absent -- there are no tanks, no dedicated healers, and no classes focused entirely on DPS. Every class feels unique both in terms of weapon skills and mechanics, and every class can contribute significantly in terms of dealing damage and helping the party with support and utility. You don't need any particular party composition to complete the PvE dungeons in Guild Wars 2 -- my group was made up of two Rangers, two Guardians, and an Engineer. According to the developers, the game has been explicitly designed so that you can grab anyone around you and run a dungeon, without worrying about which classes you have in attendance. Don't mistake this design choice for a decision to make dungeons easy, though. They're not. They're actually quite difficult -- even with three developers in our group, we wiped four or five times. Not because the dungeon was unfairly difficult or because the bosses had an unfair advantage, but because we often simply weren't paying attention and/or didn't quite have a handle on our classes yet. 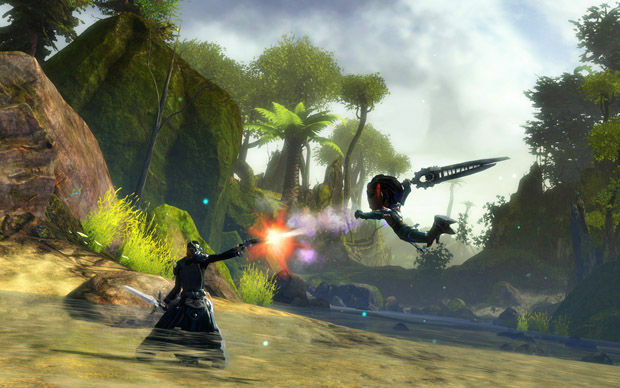 While Guild Wars 2's combat will generally feel familiar to MMO veterans, two mechanics set it apart from most other games: the ability to move while using most attacks (even many channeled ones), and the ability to dodge. Having to maneuver during combat, while a simple addition, adds a new tactical level that requires more attention. At early levels, you can get away with standing still and rhythmically pressing your hotkeys in rotation order, but you'll quickly learn that your position in relation to your enemies is important. Knowing when to dodge and how to position your party appears to be critical to success in Guild Wars 2. Since you don't have tanks, and you don't really have healers, anyone can be attacked at any time. Monster AI goes beyond standard threat/hate generated by damage, and we were told that it also takes into account a combination of things such as position (apparently the most important determinant) as well as who's already hurting. You can't just plop a tank on a boss and consider everyone safe -- because everyone is vulnerable, everyone has to know when to advance, retreat, or dodge a massive attack that could take them down in one or two hits. Because of the limited time frame of the beta, I had to make a choice between whether I wanted to dive into the World vs. World vs. World stuff, or the more standard Structured PvP. Since the World PvP was new to me (and since it seemed that's what everyone else was doing), that's where I chose to spend my time. It was, again, unlike anything I had ever played before. Throughout the weekend, the World PvP was consistently compared to the Realm PvP system of Dark Ages of Camelot, both by multiple members of the press and even some developers. I haven't played DAoC, so I can't confirm just how similar or different it is, but the general gist is as follows. 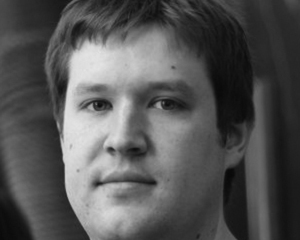 Three entire servers are pitted against each other in a two-week, persistent battle across four connected maps. Three of the maps are virtually identical, and serve as each server's starting base of operations. The fourth map is a unique one in the middle that generally serves as the central hub for the fighting. You can freely travel to any of the four maps at any time through portals, though, so raids and incursions into "home base" territory are common. The goal is to capture various structures such as supply camps, keeps, and towers, and hold them for as long as possible. The more structures you hold, the more points you earn. The server with the most points at the end of the two weeks is the victor. The basic idea may sound simple on paper, but in practice it's anything but. Keeps and towers can acquire fortifications and weapons that can be manned and fired. Players can repair gates and walls as they're attacked, and also have opportunities to purchase upgrades for the entire structure -- but only if they have the money and supply to do so. Supply camps send out supply caravans to keeps and towers, but are lightly defended. A keep that's well supplied can last for hours during a siege, as long as there is at least one player inside to initiate repairs. Cut the supply lines and blockade the entrances, and the gates will fall fairly quickly. Add another team into the mix beyond the traditional two, and you have a fluid, complex PvP system that I found to be quite enjoyable, and I normally don't participate in PvP scenarios. I tried the World PvP on Saturday afternoon, the battle having raged on for a little over a day. We were in second place: the Green team had a moderate lead on us, while the Blue team was lagging far behind. As I joined the fight, I was told we were grouping en masse to try to take back a Green keep near one of our own castles. I met up with my team at the front gate, which we were trying to batter down to no effect. Looking at the map, we realized that the Green team owned almost every supply camp across all four areas, and that the damage we were doing was quickly being repaired by someone inside the keep. Technically, with enough time, we would have eventually been able to wear it down, but a Green scout had alerted his team that we were assaulting the keep, and we ended up being driven off by a defense squad. As we tried to regroup, we realized we needed to take back the supply camps. Our commander noted that the Green team seemed to consistently travel in one single pack; because they could theoretically be attacked by two teams at once, this wasn't necessarily a bad move. We figured, though, that we could use this to our advantage. We decided to attack another Green structure -- this time a tower -- but we peeled off two small teams of four (one of which I joined) to go try to take back the supply camps while Green was distracted by this new assault. It worked. For the next hour, my small group ran across all four maps, liberating supply camps and taking down any Green caravans we saw along the way. Currently, you are only notified that one of your structures is under attack if you are near it, although you can look at the map and see who controls each point. If you watch the map carefully, you can see that you're losing ground, but you won't know anything about the size of the force or which direction they're heading in next unless you have players scouting the area. Green apparently did not do this, as we were able to take all but one supply camp for Red. With their supply lines cut off, Green had a much harder time defending their points. We all grouped back up, and went on a rampage across Green's home territory, capturing four or five towers and keeps before we were eventually located and repelled. I logged out that night in pretty good spirits, convinced that we had put ourselves in a great position, until I logged back in Sunday morning and found that Blue had mounted a huge comeback overnight, taking virtually all of the territory we had previously won. Oops. Guild Wars 2 seems to have kept many of the basic structures and tropes of the MMO genre (levels, five-man dungeons, distinct classes), but much of the core MMO gameplay has been tweaked or expanded to create a new experience. MMO fans looking for something new will, I think, enjoy how social this game is, and appreciate that ArenaNet has tried to make group questing and dungeon running smooth, painless, and natural. PvP fans, especially those looking for persistent and complex battles, should enjoy the World vs. World. vs. World gameplay. If you've never played an MMO before but are interested in the genre, the lack of a subscription fee and the accessibility of the game may make Guild Wars 2 worth checking out. 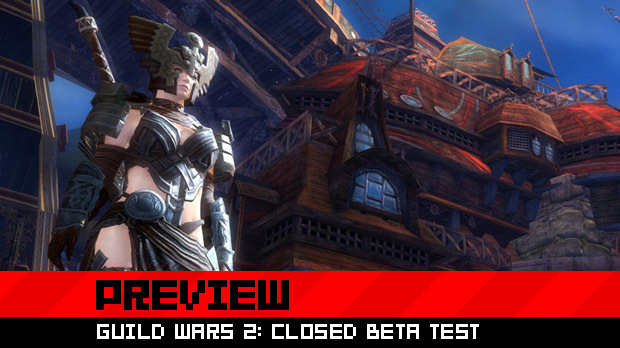 In a genre that's filled with clones and rehashes, the beta of Guild Wars 2 was refreshing. While there's not necessarily anything wrong with any previous MMOs, it's nice to see that ArenaNet is taking Guild Wars 2 in a unique direction.